&middot; More resources are available to you than you realize. &middot; Living a changed life works best when a few friends get involved. &middot; When you relearn what "good" is, you experience more goodness in your life. &middot; Taking a healthy risk is always worth it, even if you fail. "I expected to come away from reading Spark impressed with Jason Jaggards thoughts and encouraged by his stories. But I was also inspired to start taking my own risks to make a difference in small ways and big. This book is a valuable tool for anyone looking to move from contemplating life to fully living it." "Jasons flair for writing makes Spark as enjoyable to read as it is insightful. His drumbeat is that small risks often lead to dramatic transformations. Jason offers encouragement to everyone who seeks to make their lives and the world around them better, one risk at a time." "Game changer! Its a term that is used to describe the monumental changes that occur in an array of spheresfrom politics to the music industry to sports and everything in between. 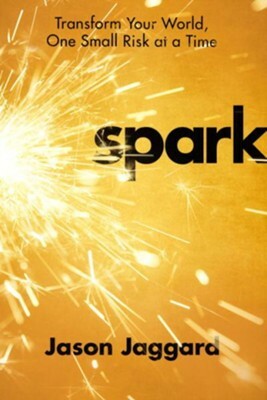 Spark is a game changer for life and those who desire to live life loud." "Spark will ignite you. Jason Jaggard invites everyone into movement by creating beautiful spaces (Spark Groups) where each person embraces the genesis of change. Spark reveals an author with a contagious passion for others and the willingness to walk by your side as you take meaningful risks. Anyone will benefit from reading this book, and bold readers will be charged, challenged, and changed." I'm the author/artist and I want to review Spark: Transform Your World, One Small Risk at a Time - eBook.